It has not been too long since Rossini’s Barber last had an outing: see my review of Glyndebourne at the Proms this year. Here is the fourth revival of Moshe Leiser and Patrice Caurier’s production (first seen in 2005). It is a delightful, fairy-tale Barber, and the production strengths I discussed in my previous review (of the third outing, in 2014) remain as solid as ever. Which is more than can be said of the conducting, however. Then under the experienced and expert Mark Elder, who underlined his Rossinian credentials in the Prom Semiramide this year, pretty much all was well. Here, Hungarian conductor Henrik Nánási led a lacklustre account, right from the workaday Overture; was this really the same orchestra that had shone in Norma the previous evening?. The same orchestra that had effectively saved that evening? Ensemble, too, was at times approximate between pit and stage; first night hiccoughs, perhaps, but Norma had been a first night, too. Strings in the Overture sounded scrappy and harsh of tone; watching Nánási, it looked like he was trying to do too much and the effect was counter-productive. He has a habit of taking things just under tempo, robbing the score of its fizz, and its dramatic trajectory. A shame, as he was working with a fine cast. Nánási debuted at the Garden in 2013 with Turandot; he is General Music Director of the Komische Oper Berlin, a post he has held since 2013. 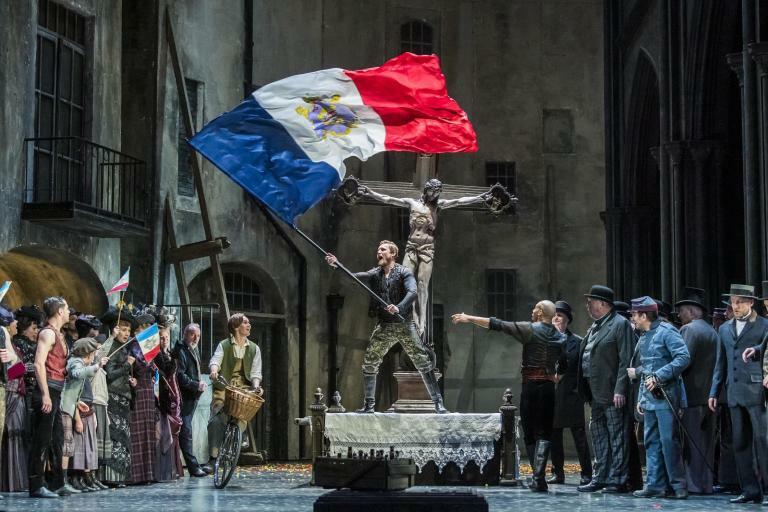 The part of Figaro is taken in September by Italian baritone Vito Priante – most recently seen here as Escamillo in Carmen – and French baritone Florian Sempey in October, debuting at the House. Priante, then, it was on this occasion, and he is superbly assured, and a great actor. His “Largo al factotum” was an object lesson, vocally and dramatically. Needless to say, the text is expertly negotiated at all points; Priante also has a great sense of comedic timing. One extra point on the costumes: is he supposed to look like Super Mario towards the end of act two? The Rosina is Daniela Mack, a Buenes-Aires-born mezzo, finalist in the 2013 Cardiff Singer of the World. She has previously taken Rosina on for San Francisco Opera, and has a terrific voice, full and under complete control. Truly feisty, being imprisoned in the house is obviously true torture for her. Her showpiece “Una voce poco fa” was magnificent and simply fearless. As the Count Almaviva, Mexican tenor Javier Camerena brings a wealth of experience to the role (Met, Vienna State and Bavarian State Operas), peaking perhaps towards the end of the second act. Portuguese baritone José Fardilha is no stranger to the role of Doctor Bartolo (Paris Opéra, Barcelona, Stuttgart, Madrid), but he was a stranger to Covent Garden, as this was his Royal Opera debut. Fine and strong, with great timing, it was a strong debut. But if there is one singer here who brings a legendary status to proceedings it is Ferruccio Furlanetto’s Don Basilio, a brilliant assumption of the part from all angles. The opera opens with Fiorello, and it pays to cast that well. Here, it is, in the shape of another Hungarian, baritone Gyula Nagy, this one a member of the Jette Parker Young Artists Programme and another singer making his Royal Opera debut. One hopes to hear more from him in the future. The Berta, too, was superb: New Zealand soprano Madeleine Pierard excels in all respects, making the most of her snuff-induced sneezes (her bulbous red nose helps the comedy along no end), while the small roles of Ambrogio, Officer and Notary were excellently delivered by Jonathan Coad, Donaldson Bell and Andrew MacNair respectively. With a production such as this, with its wacky, discombobulating box on stage that issues hither and thither as the madness reaches its peak, its beautiful nocturnal evocation in the opening scene and its simple sense of play, it is difficult not to come out satisfied. The singers were clearly giving their all. If only the orchestral contribution had matched it all, but it is impossible to ignore the fact that it was under par. Still worth seeing, particularly for Daniela Mack’s strong Rosina, Furlanetto’s masterly stage presence and Priante’s idiomatic Figaro, but not the life-enhancing experience one hopes for from this magnificent opera.